File Recover Plus is designed to quickly and efficiently recover deleted files due to deletion and/or lost files due to repartitioning or reformatting from a variety of storage devices and media. In my case it did not perform as suggested. The installation took approximately 20 seconds to complete, and the installation took up less than 2MB of disk space. 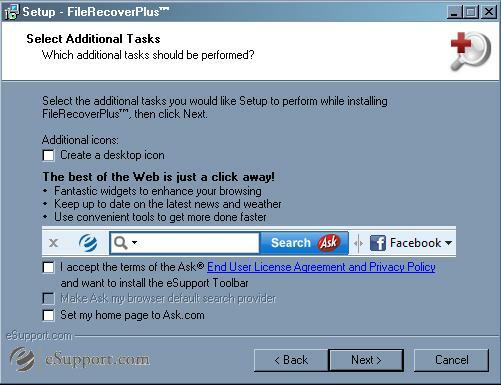 During the installation, File Recover Plus asked if I would like to install the Ask Toolbar. Obviously, I declined. Little did I realize, this would be the least of my concerns when testing this application. I STRONGLY DISLIKE it when I’m asked to install third party tools. After reading the specs and technical information on what File Recover Plus was capable of doing, I immediately put it to the first test: See what can be recovered from the 4GB IDE drive that’s had its partition removed and been reformatted. Before initiating the first scan, I decided to see what the filter options interface was like. This is where you can specify what kind of file names, and timestamps to have File Recover Plus look for. As you can see below, it immediately failed at delivering at least one thing as advertised. I decided that next I would scan a different drive that hadn’t been formatted, but most of the data had been deleted from it. Below is a screenshot of the second scan in progress. I expected it to start listing files that it found, but it didn’t. Instead, 10 minutes later, it crashed. I was willing to dismiss this error on the grounds that perhaps another application had been competing for memory, however, I have 2GB of RAM installed and a 2.94GHz dual core processor on this test computer and little else going on. Before I got around to clicking the box above, Google Chrome had “encountered a serious error”, and needed to close. Simultaneously, the box below made itself known. Admittedly, I was a bit concerned, and was hoping I wasn’t about to encounter a cascade failure. Thankfully, I didn’t. Repeating a scan on the same drive resulted in the same kind of error. Perhaps it detected too many files on one drive. Ignoring the other results I had on other systems, I decided to try the primary drive, since it was fairly uncluttered, and by comparison, it doesn’t really have a whole lot of data on it. It’s a 20GB drive. 15 minutes later, and we’re greeted by The White Screen. This does not bode well. Another 10 minutes later, and the results are actually displayed. I figured all was well until I scrolled about halfway down and was greeted by an error I literally have not seen in years. After having tested this application on several other systems, and each of them having worse results than below, I will simply let this one speak for itself. I also know for a fact that there have never been anywhere near that number of files on this particular primary drive at any given time. While the interface is very simplistic, and easy to use with the novice user in mind, the numerous, frequent, and sometimes counterproductive shortcomings (like unexpectedly erasing a partition), I would hesitate to say that it’s designed for any user. Not sure how it managed to earase my partition, it’s suposed to recover data not destroy it. File Recover Plus installed quickly, and took up very little hard drive space. Beyond that, I don’t have a single positive thing to say about this program. I would not recommend using or purchasing this product. I’m not saying this to be mean, but don’t even bother with this application. Small installation size, pretty interface, quick installation. I couldn’t get it to successfully run on any of the 5 systems I tested it on. One drive that it scanned, the partition mysteriously vanished. That’s not even counting the other error messages that it generated. There are far better options out there. Not purchasing File Recover Plus is a good start. Consider Recover My Files or Remo Recover Pro instead.